I've long admired Salvatore Ferragamo's Varina ballerina flat - chic, understated, and classic, it offers everything a good shoe should. 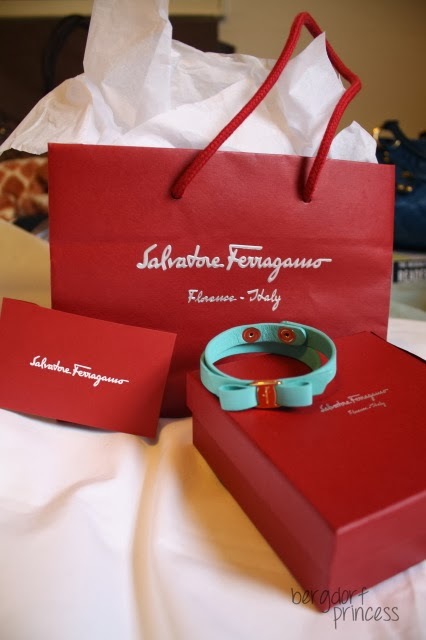 I took advantage of a Friends & Family sale at Shopbop to order these turquoise, Tiffany-blue colored Varinas...and later, at the Ferragamo store on Fifth Avenue, I snatched up the last Vara bow bracelet in the same color. The Vara bow bracelet can be purchased from Bloomingdales, Zappos, and LuisaViaRoma. If you like the Varinas, you can see more colors here. Launched in 2007, the Varina flat is a spin on the iconic Vara - a mid-heel pump with the same instantaneously-recognizable bow and plaque. The shoe has been around for a whopping thirty five years - since 1978! Ferragamo recently celebrated the anniversary of the shoe by offering a customizable version. The bow on the shoe was originally meant to be leather, not grosgrain, but the maker misunderstood and made it grosgrain as with the prototype. The Vara was designed by Ferragamo's daughter Fiamma. I'm also obsessed with the dusty pink version of this bracelet. That's such a nice colour to have flats in. And the matching bracelet is perfect. When I first saw they I didn't really like them, but scrolling down and seing the pictures of them being worn, I kind of fell in love. I'm a big flats lover, they're basically all I wear during summer (it's usually not warm enough to wear sandals up here). I think I have to put these on my wishlist, after I get a pair from Chanel. I might even have to get the same colour as you, it's to die for. I found them in hot pink on Shopbop as well, they're stunning. Oh, and I love the matching bracelet! I want this color too :) I seen it at Nordstrom. But the bracelet?!?! LOVE IT!! Wow! how amazing collection. I always dreamed to buy these kind of boots and foot wears. Last week i bought some from Tory Burch shoes sale and loved them too.